The proper method for smooth icing a cake and several basic decorating techniques. How to color icing, fill a decorating bag and change decorating tips. How to make stars, zigzags, ruffles, grass (hair), lines and more. Students will then ice and decorate a cake using techniques they've learned in class, or they can make up their own. Each student will go home with a fully decorated cake. 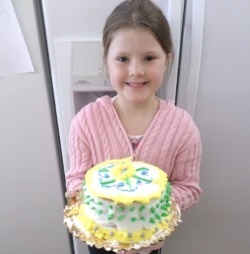 This beginning cake decorating class for kids is designed for ages 7 -12. Students younger than 7 will need an adult to register and take the class with them to help the child during class. Parents may also register and participate in this class with their child. Students will ice and decorate a cake using techniques practiced in class. No supplies are needed for this class; students will work with classroom tools. An aprons will be provided for each student but feel free to bring your own, if you prefer.